Video game developer Square Enix is hard at work on Dragon Quest XI: In Search of Departed Time, the latest title in the popular JRPG series. Many elements that are familiar to series fans will be making a return, including the fan-favorite casinos, and Square Enix has released new details regarding the addition of horse racing as well as small medals, which are rumored to earn players hefty rewards. 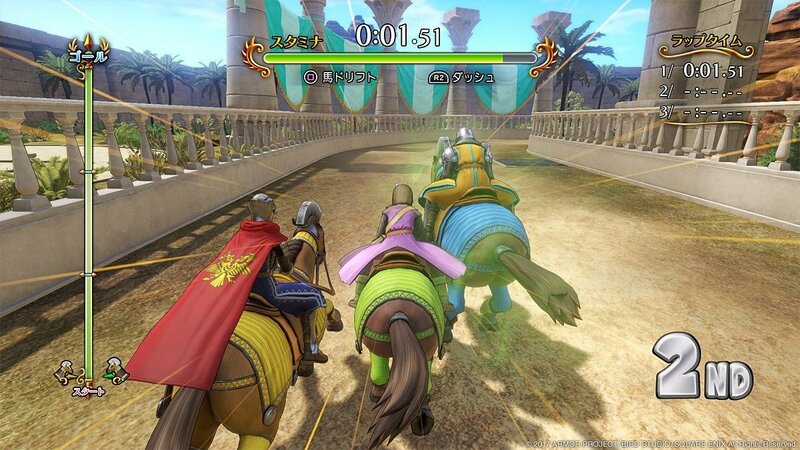 Horse racing is a new mechanic for the Dragon Quest series, and it looks to be a fun addition. Players can find themselves stumbling upon horse racing in the game's world, and after a while can take it upon themselves to enter the arena. Players will face off against rival racing knights in fast-paced matches that include obstacles like jumps, quagmires, and pumpkins. As might be expected, winning races will bestow various prizes. Additionally, the return of casinos to Dragon Quest XI means players won't be short of any fun minigames, and among the touted games included are slots, Poker, and Roulette. In the traditional gambling fashion, players can stake their coins for a chance to win increasing amounts of coins, which can then be exchanged for rewards. Lastly, Square Enix has provided some insight toward Dragon Quest XI's small medal system. Small medals can be found scattered throughout the in-game world, and rumor has it that there's a specific character in the game that is willing to trade rare rewards in exchange for the medals. As is often the case, Square Enix is staying tight-lipped about the rewards, but we'll likely get to know more as the game starts hitting store shelves. Dragon Quest XI: In Search of Departed Time will be releasing for PlayStation 4 and Nintendo 3DS on July 29 in Japan. A Switch version has also been touted, but Square Enix has not yet provided a firm release date. Still, players who want to get an extended look at the casinos, small medals, and horse racing system can find loads of additional information including screenshots over at the official Dragon Quest XI website. There are many more excellent Nintendo 3DS titles to check out featured on our list of the Best Nintendo 3DS Games.